Diversity at its best. Good luck to you ladies! We NEED much more of this in house & senate!! I believe the USA would be a top world contender all around then. Democrats have to keep reminding themselves, and America, that they beat Trump and the Republicans in the competition that mattered most - the only truly national competition this fall. The Democratic mandate is not overwhelming. But it is real. Hey Momma we're in the drivers seat for the first time in years. IT is up to us to get organized to keep these newly-elected leaders accountable to an organized and active base -- otherwise they will be working alone in hostile territory. Has there been any analysis of election results in all the various states where 2018 teacher strikes took place? If you know or have seen any such summary article, please let me/us know. Did the organization and experience of those struggles have an electoral impact? Since Pence is guilty as sin regarding Russia collusion, why not expose his crimes first? Trump couldn’t get another VP without a majority in both houses of Congress. 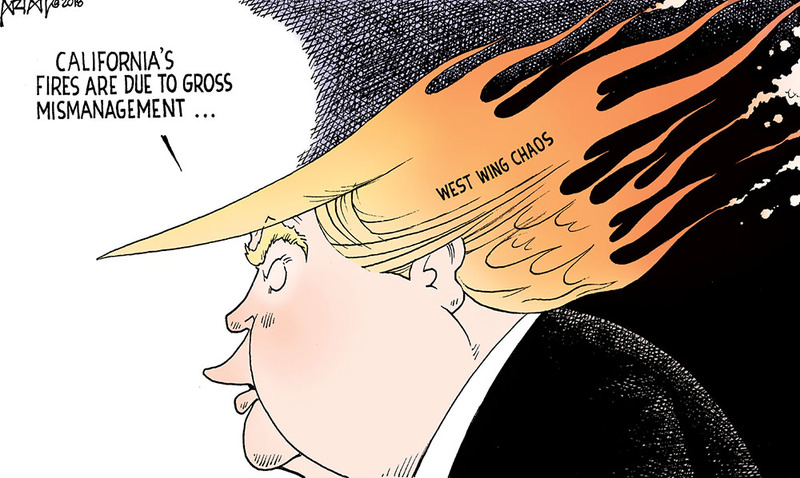 Then pursue Trump’s crimes. There is a presidential order of succession . .
Convict him of multiple felonies. Then straight to prison. The largest and most lethal fires in California history continue to burn throughout the state. Elsewhere, 100-year floods are happening annually. Superstorms and record-breaking droughts are all becoming the "new abnormal." This is not random. This was predicted. This is a result of climate change. This is due to our unabated use of fossil fuels. Esso donated more dollars than any other oil company to help Bush win the 2000 election and then reaped the rewards when Bush ditched the Kyoto protocol, an international agreement to stop global warming. Esso was the most active company to undermine this treaty. Esso refused to accept the link between burning oil and global warming. 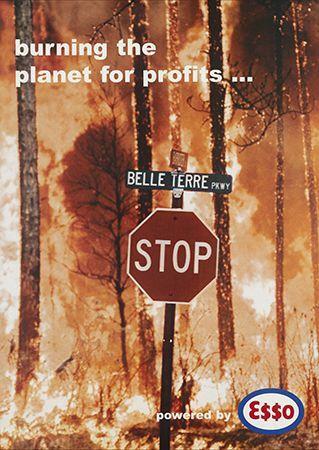 At the time, Esso invested none of their massive profits in renewable energy or green fuels. 1. More details on the Pilgrimages - Is it just Texas or also San Diego, Arizona, etc, and when do they arrive? What about rabbis (like me) who would like to join? No information. 2. What's with the 2017 photo of Chabad HQ group? Are you playing into the stereotype that Rabbis all have beards, peyot, and wear black hats like the Rebbe did? And then you start the article by quoting a female rabbi who couldn't have a beard even if she studied in Crown Heights for 50 years! I also doubt that she wears a black fedora. Stereotyping of what Jews "look like" got many Jews in big trouble only 75 years ago. I am requesting for all who read my email to approach it with an open mind and an open heart with the understanding that you may not agree with what I will put forth and that is okay with me. This is not an email to persuade or to convince, it is an email with my voice and my experience and my truth - one that may not be comfortable for some. As-Salaam Alaikum. Excellent! This is why I love you! In recent days there have been some calls from some people in the Jewish community to boycott the planned Women's March on January 19. This call has been explained on the ground that some of the March leaders have been unwilling to specifically denounce Minister Farrakhan of the Nation of Islam for his many blatantly anti-Semitic views and speeches. One of the March leaders cited in this call has been Linda Sarsour, an important leader of the Women's March movement that became powerful the day after Mr. Trump's inauguration as President, and onward from then. I know that Ms. Sarsour has not only spoken words but also taken action strongly condemning anti-Semitism. She has, for example, raised hundreds of thousands of dollars to help repair desecrated Jewish cemeteries and to assist the survivors of the "Tree of Life" synagogue mass murders in Pittsburgh. 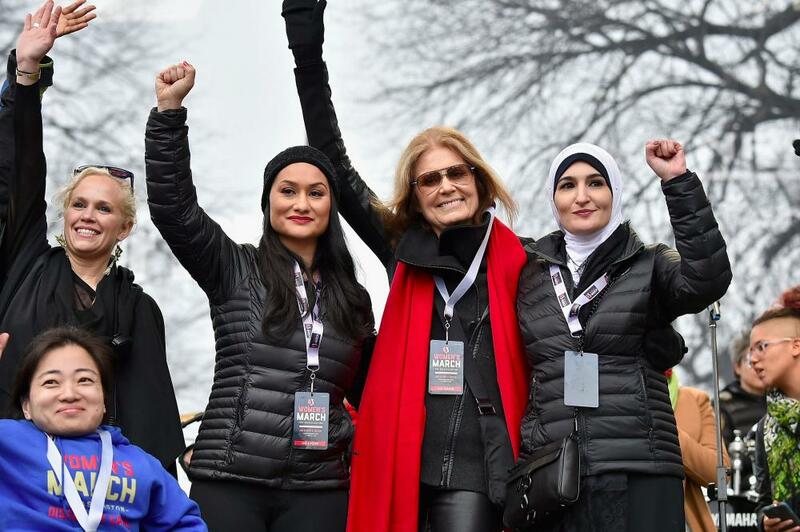 In this photo, Linda Sarsour is at the far right, next to Gloria Steinem along with other leaders of the Women's March in 2017. My own opposition to a total BDS directed against all of Israeli society, along with my strong opposition to the Israeli government and the Occupation, comes from my own ties to the decent elements in Israeli society. So from my own responses I learn to respect the responses of a Palestinian-American with strong ties to the Palestinian community under military Occupation in its homeland, and to understand why such a person would feel drawn to BDS. In this way I honor our disagreement -- both sides of it – even while I hold strongly to my own view. Should my disagreement on this question push me toward boycotting a movement that I strongly support – the Women’s March -- in which Ms. Sarsour is a leader? God forbid! and that through the Trump-Netanyahoo alliance subjugates Palestinians. Resistance to white nationalism connects the fuller liberation of American women from sexism with the fuller liberation of the Jewish community from anti-Semitism. In our very diversity, our different cultures, our disagreements, we are the rainbow refractions of ONE light. The Quran teaches that humanity was created in many different cultures precisely so that we can learn to understand each other. Jews affirm in the Sh’ma that the Divine Interbreath of Life is ONE. The Torah’s call that we pursue “justice, justice” – in its different voices -- is ONE. The love we owe each other is ONE. To Lila Watson's and Linda Sarsour's challenge, I respond: We have indeed come together because we do believe that "your" liberation is bound up with "mine." So let us work together! I think the defeat of Question 1 is a defeat for patients and nurses. The opposition used fear techniques similar to those we face in a union election campaign, Fear! ... not enough nurses, cost too much, there will be long lines at emergency rooms, small hospitals will close... none of these criticisms were true, unless the hospitals just stuck their feet in and refused to adjust to the staffing requirements. Also safe staffing has been an item in negotiations for years. The hospitals could have negotiated mutually acceptable safe staffing rules with the union. Also the Mass Legislature could have negotiated with the union before the question went to a state wide ballot. To put all the blame on the union is wrong! It seems that this new deal in New York is good for Amazon only. And politicians who want to claim job growth. Remember this is the company that wants 100% automation some day! Undocumented immigrant parents cannot get food stamps. Their US born children can. But. A part of the Trump program to starve the beast (and enrich the rich) has been to starve the babies. As a result, immigrant families have stopped getting food stamps (as they realize that food stamps will doom their green-card applications under Trump). 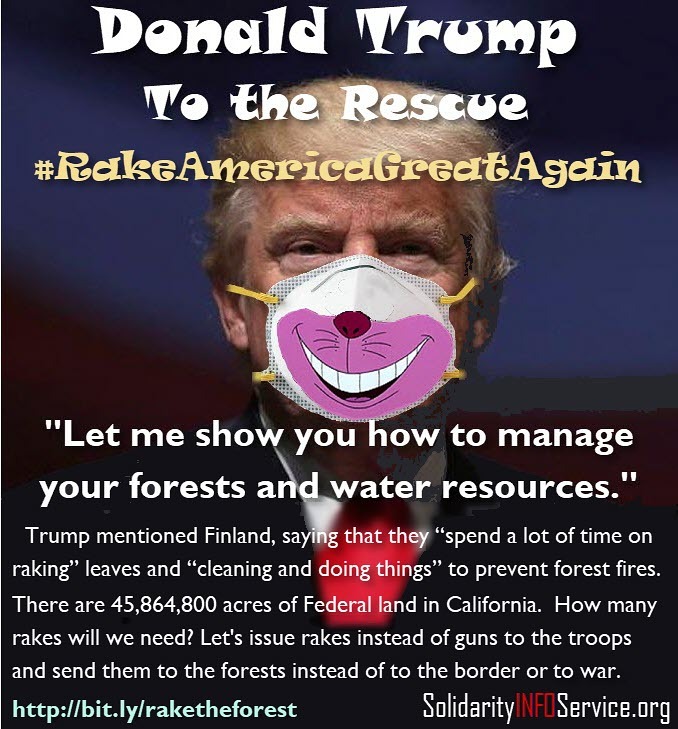 Here, a very good report on a very bad situation. Judith and I were talking to a homeless woman yesterday who got a Thanksgiving Turkey from church but who had no place to cook it (of course). We've taken the first few steps toward driving these criminals from power. There's so much more to do. Thanks to H. Claire Brown for the report on the Public Health Association study and to Portside for the link. In Canada employers pay a payroll tax of about 1% of wages per year. Depending on the amount of employees. Small businesses of few employees are not taxed . When you think of companies with 6000+ employees, they can afford it. US companies in Canada do this. That leaves the other top 20 percent liable for tax increases which could reverse some of the massive cuts to the ultra rich who have always received the most benefit from previous cuts. Bob Wing's article, both an addition to and an explanation of his new book, is very good. I may have a few quibbles about how he sets up the international situation, or the nature of the transnational capitalist class, by that's minor here. I would like to underscore a point he needs to focus on more sharply. Bob correct argues for broad fronts and building coalitions, as well as emphasizing the importance of states, counties, and cities. This is on target. But I would like to stress that to build coalitions, especially at the base, we all need an organization to build coalitions WITH, ie, we need a group of our own to take a seat at the table where all the other members of the coalitions-in-formation are seated, or will be seated. We cannot simply be catalysts. We have to be players in our own right. That's the importance today of DSA, PDA, Our Revolution, and Indivisible, et. al.-- local groups with local chapters and thousands of members. We need to build them and make them strong. The harder the core, the broader the front. The US is backing into a sort of modern prehistory when no one had rights except whites, specifically, male whites. They are making the anachronic become the future. EU is destroying itself. It will continue to divide and decay until there’s no nation or will have to take measures to eliminate the hate wave is consuming it. Re: Are You Ready To Consider That Capitalism Is The Real Problem? Finally the light goes on . .
Capitalism breeds race and stratification cultures. This provides an important analysis from Victor Grossman. But Grossman doesn't really explain why the Linke have been unable to benefit from the GroKo collapse and win voter support as a real alternative, Their program should be attracting millions of supporters and some of their leaders are excellent campaigners, but somehow they haven't resonated with the voters. Wagenknecht's Aufstehen hasn't done anything to resolve the issue either, it is just threatening to split the Linke. I don't understand why they haven't done a lot better and wish Grossman had been able to enlighten me, but he hasn't here. Grateful both sides reached an agreement. 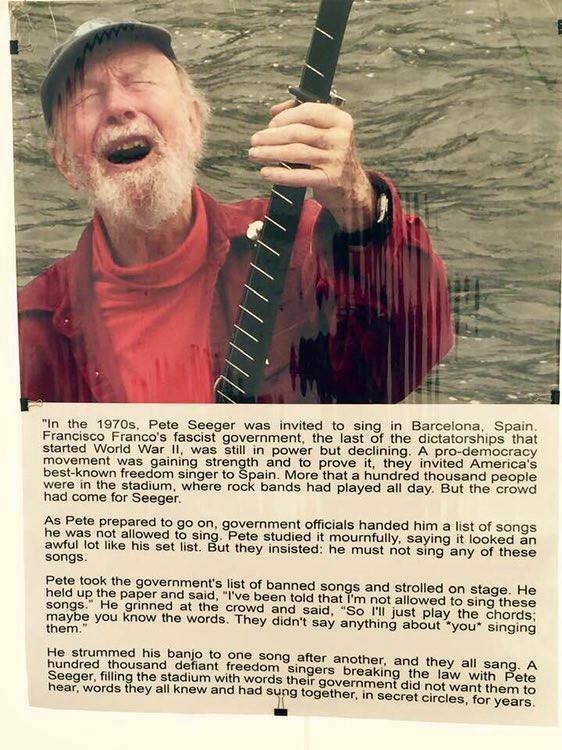 Solidarity and persistence pay off. I only wish the Yankees and the Dodgers stood with the Workers. What a sad and disturbing happening. Please consider contributing to Portside. For years, I have found Portside to be the most consistent source for the most important news and commentary for those seeking information and thought-provoking insights relevant to our people everywhere; extremely grateful to Portside, for years! 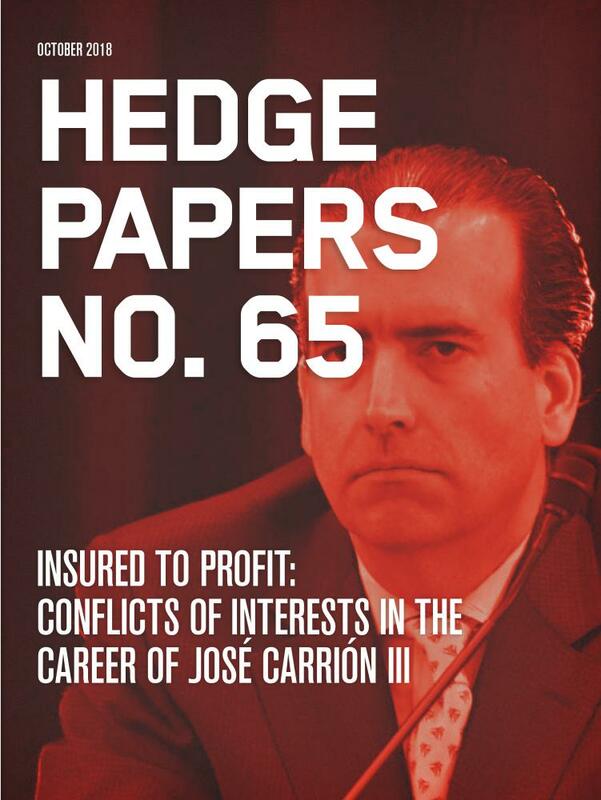 The Hedge Clippers campaign includes leadership and collaborative contributions from labor unions, community groups, coalitions, digital activists and organizing networks around the country, including the Strong Economy for All Coalition, New York Communities for Change, Alliance for Quality Education, VOCAL-NY and Citizen Action of New York; Make the Road Connecticut; New Jersey Communities United; the Alliance of Californians for Community Empowerment (ACCE) and Courage Campaign; the Grassroots Collaborative in Illinois; the Ohio Organizing Collaborative; ISAIAH in Minnesota; Organize Now in Florida; Rootstrikers, Every Voice, Color of Change, 350.org, Greenpeace, the ReFund America Project and United Students Against Sweatshops; the Center for Popular Democracy and the Working Families Party; the United Federation of Teachers and New York State United Teachers; the American Federation of Teachers, the National Education Association, and the Communication Workers of America. 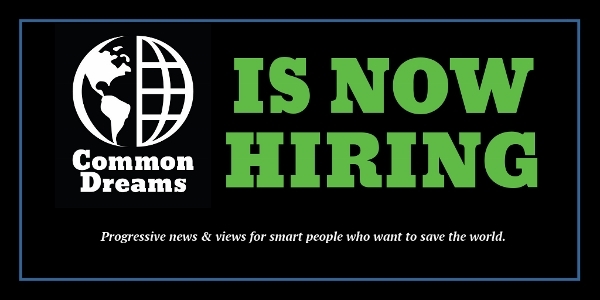 Common Dreams is currently hiring for a full-time senior editor & staff writer to help guide our newsroom team. Position includes spearheading all aspects of daily news operation, including: news selection; assigning and writing stories; managing in-house reporting staff, and assisting with outside contributors. Ideal candidate is experienced journalist and sharp-minded news junkie with progressive worldview. Top-notch editorial judgement and leadership skills required. Not an entry-level position, but ideal candidate is ready to put years of quality experience and passion to work for an outlet whose commitment to a better world comes first and where the bottom line is maintained by serving our readers, not investors or corporate advertisers. This is a full-time, salaried position in our offices located in Portland, Maine. Please note, telecommuting is not possible. Application Deadline: Dec. 15, 2018. Please send cover letter detailing your experience and interest in the position; your resume; and no more than 3 recent samples of relevant/published work. Email to senioreditor@commondreams.org with subject line: "Senior Editor / Your Name." No calls, please. Nov. 26, 8:30 -10:30 Eastern time, 7:30-9:30 Central time. The Democratic Party regained control of the US House of Representatives and numerous state and local offices but lost ground in the US Senate. There was a huge voter turnout, and a record number of women won office including younger women of color and open socialists. Is the progressive voice now stronger within the Democratic Party? What is the future direction of the Party and how can the Left and the people's movements have influence? How does all of this shape up for the Trump resistance and the opening dynamics for the 2020 presidential election? A special two-hour edition will examine these and other questions resulting from the historic 2018 elections. There will be presentations and reports, followed by discussion. Steve Cobble -- co-founder of Progressive Democrats of America and associate fellow of the Institute for Policy Studies, Washington DC. CCDS members from around the country, and other invited Left and socialist speakers. In the fall of 2015, Turkey declared war on its own citizens, bombing their homes, stationing snipers on rooftops, and destroying the ancient Kurdish district of Sur, a UNESCO historic site within the city of Diyarbakir. What was the Turkish government so afraid of? Based on news footage and live interviews, the film by Hicran Urun and Zana Kibar is the untold story of how radical Kurds built a system they call “democratic autonomy” in Sur and other cities of northeast Turkey—a system based on pluralism, local control, and full citizenship for women. The Erdogan government found this level of democracy so threatening it responded by destroying the city, killing or jailing many of its activists, and dismantling the structures they had put in place for women’s liberation. Ozlem Goner s an Assistant Professor at the Department of Sociology and Anthropology at the College of Staten Island, CUNY. Her book, entitled Turkish National Identity and its Outsiders: Memories of State Violence in Dersim , was published by Routledge in 2017. Meredith Tax has been a writer and feminist organizer since the late Sixties. Her most recent book is A Road Unforeseen: Women Fight the Islamic State . She is on the steering committee of the Emergency Committee for Rojava. The Emergency Committee for Rojava was formed in 2018 to encourage and help facilitate coordinated action to end the occupation of Afrin and support autonomy for Rojava. Join former Greek Finance Minister Yanis Varoufakis and Jacobin for a conversation on the fight against right-wing populism in Europe. Yanis will be joined by Daniel Denvir, the host of The Dig, a podcast from Jacobin magazine. On both sides of the Atlantic, economic crises have weakened the legitimacy of neoliberal capitalism and made migrants compelling scapegoats. While recent years have seen a resurgent left in the US and UK, the Right has also taken advantage of growing public disillusionment with the status quo. 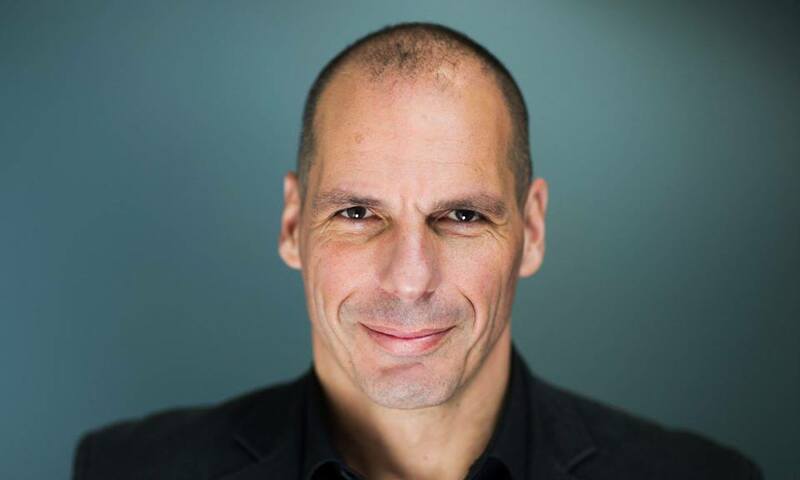 In a live recording of The Dig, Varoufakis will discuss his European Spring initiative and address the sharp debates over how the left should move forward at a moment that poses incredible danger but also historic opportunities. Accessibility: Arnhold Hall is wheelchair-accessible. Please note: This event will not be livestreamed. It will be made available as an episode of The Dig on Jacobin Radio. You can subscribe to The Dig here. The European Union is disintegrating. After years of austerity, millions of people have lost faith in the European project. In this vacuum, a new axis of authoritarian leaders — from Salvini in Italy to Orbán in Hungary — is rising through a toxic mix of misogyny, xenophobia and nationalist hate. DiEM25 was formed to restore hope to Europe. We are united behind a shared vision of Europe as a realm of democracy, sustainability, prosperity, and solidarity. And — for the first time — we are bringing this vision to the ballot box in the 2019 EU elections. 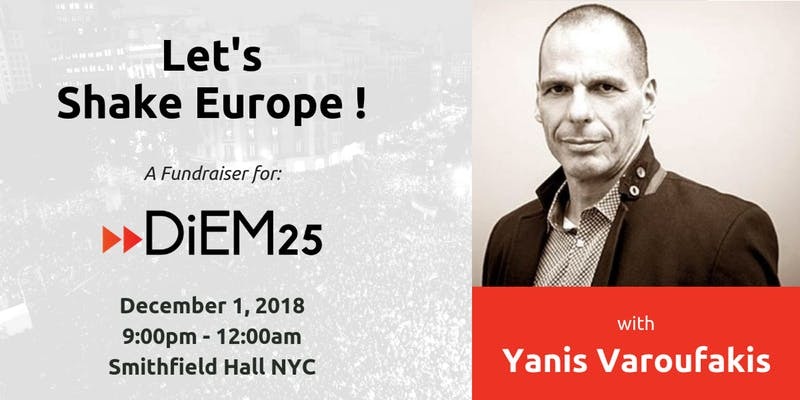 On Saturday 1 December, join Yanis Varoufakis and the DiEM25 NYC teamat a special fundraiser to shake Europe! The fundraiser will follow an event with Jacobin Magazine at the New School, "Challenging the New Right-Populism: A Conversation with Yanis Varoufakis." Get a free ticket here but also come celebrate with us afterward! The Fundraiser will include a DiEM25 Raffle to win signed books by DiEM25 co-founders Yanis Varoufakis and Srecko Horvat. Buy tickets here — and join us on December 1 to see the winners. DiEM25 depends 100% on donations from our members — we do not receive any money from big corporations, foundations or governments. All proceeds from the fundraiser will go to supporting our movement to stay alive. 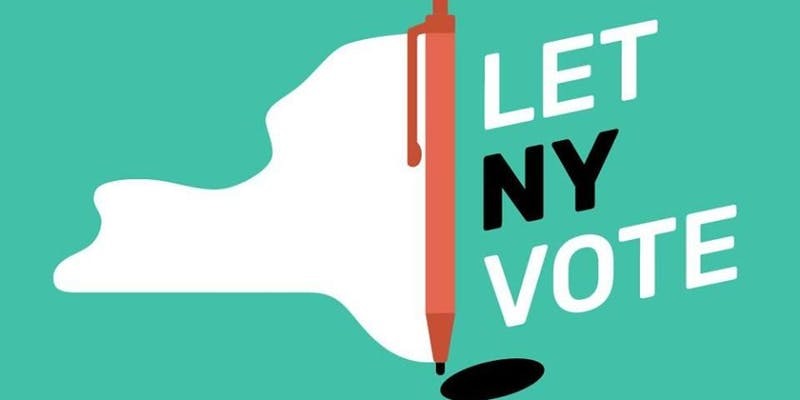 A grassroots convening to break down barriers to voting and empower every day New Yorkers in our democracy. 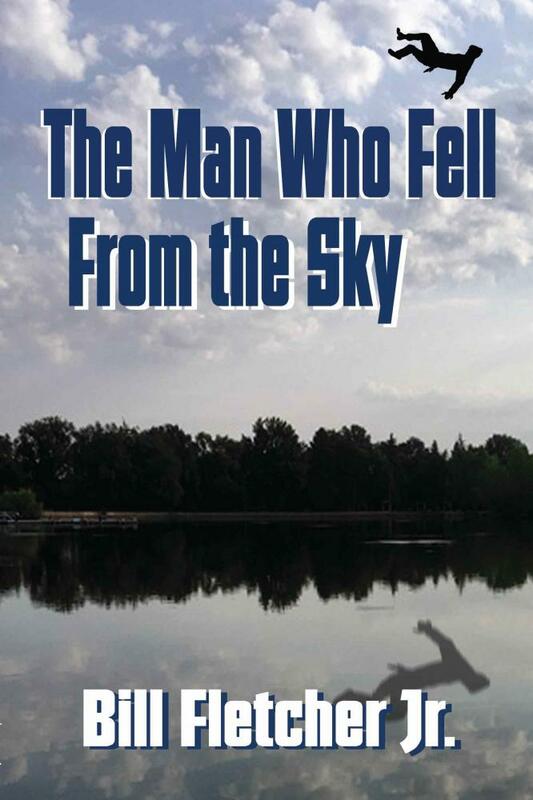 Join award-winning journalist and lifelong social justice advocate Bill Fletcher, Jr. (NWU DC Chapter member) for the launch of his first work of fiction: The Man Who Fell From the Sky, a crime novel. Bill will discuss his novel’s exploration of racism and inequality through the eyes of a young journalist of Cape Verdean descent who investigates a murder in a small Cape Cod community in 1970 while covering the anti-Viet Nam War protests and the Black Panthers. His interviews of people of color, African-American and Cape Verdean, bring him a new understanding of the African diaspora and the challenges of surviving in America. Set within a Cape Verdean American community undergoing a transformation of its own consciousness, Fletcher’s crime novel dives deep into two timely questions: Is revenge ever a moral form of justice, and when does silence become complicity as criminal acts are committed before your own eyes? 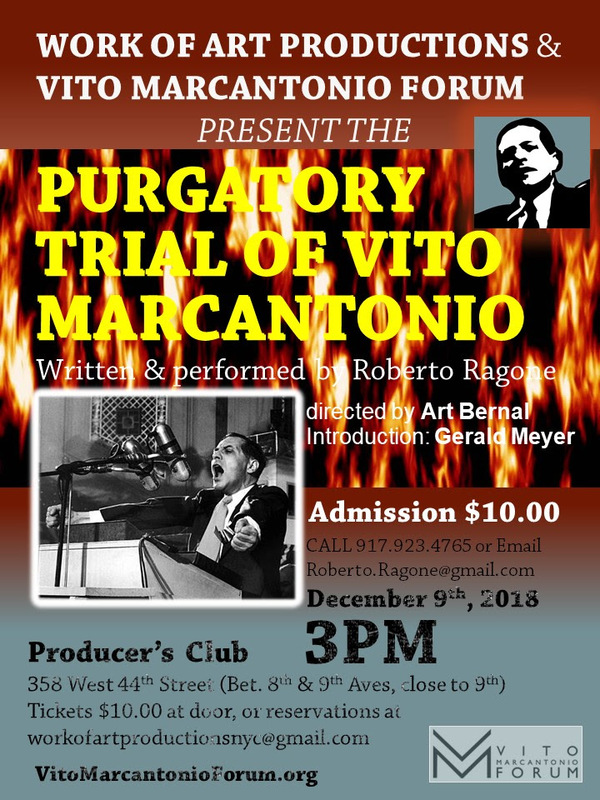 Bill will also discuss the unique ways in which a work of fiction can explore and reveal important truths about the human condition, as well as touch the heart and stir a people to take action. 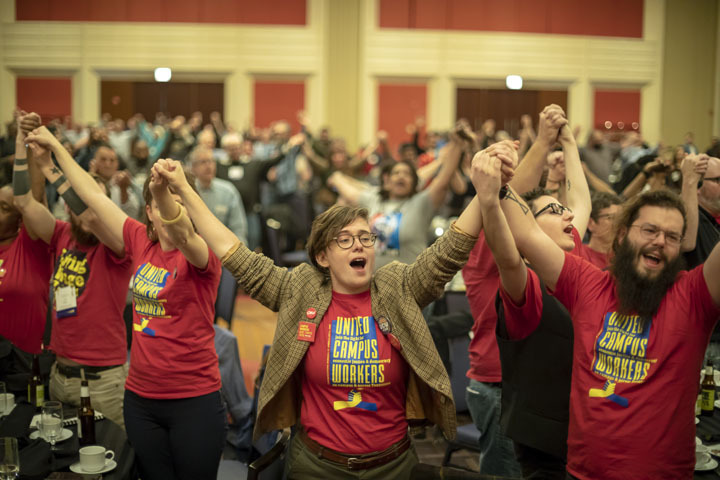 We're excited to announce that the next Labor Notes Conference will take place April 17-19, 2020 at the Hyatt Regency O'Hare in Rosemont, Illinois. Our 2018 Conference, with 3,000 union members and worker center activists in attendance, was our biggest yet. We hope 2020 will be even bigger! Stay tuned for more details as we get closer. More details will be announced as get closer to the conference. For now, mark your calendars and save the date! Can't wait that long? Neither can we. In 2019, our 40th anniversary year, we'll be organizing Troublemakers Schools and other trainings in cities across the country. Want to bring us to your city or union hall? Contact training@labornotes.org. And stay tuned for details on plans to commemorate our 40 years of troublemaking. The Labor Notes Conference is the biggest gathering out there of grassroots union activists, worker center leaders, and all-around troublemakers. Join thousands of union members, officers, and labor activists who are on the front lines in our workplaces and our communities, organizing new workers and agitating together. Meet troublemakers from across the country and around the world. More than 200 meetings and workshops include creative organizing tactics, beating apathy, running for local union office, winning contract campaigns, bargaining over technology, understanding the economy, surviving “right to work,” and reviving the strike. Organize with others in your union, industry, or campaign. Face-to-face meetings to share tactics and swap notes are the heart of the Labor Notes Conference. Join an existing industry, union, or caucus meeting—or contact us to set one up.